I have the perfect treat for an Easter Giveaway. 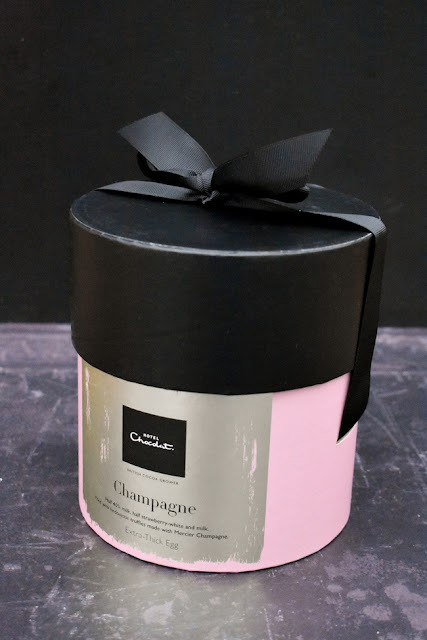 An Extra Thick Champagne Easter Egg from Hotel Chocolat. Just one of their fabulous selection of Easter treats. 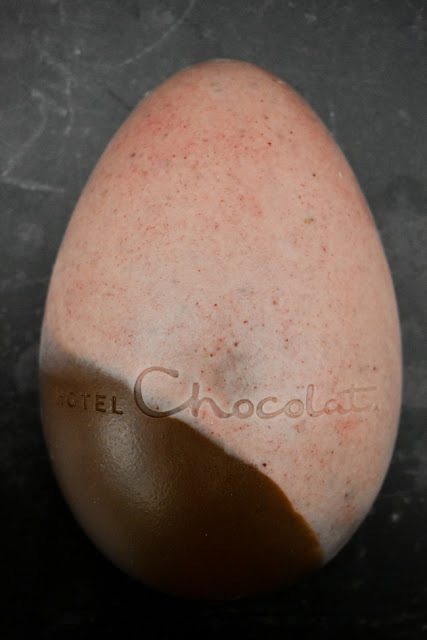 Hotel Chocolat are the home of superior quality chocolate here in the UK and they don't let us down with this egg. Unwrap the gold encased egg and the shell is extra thick ombre chocolate. A mixture between milk chocolate and strawberry milk chocolate. 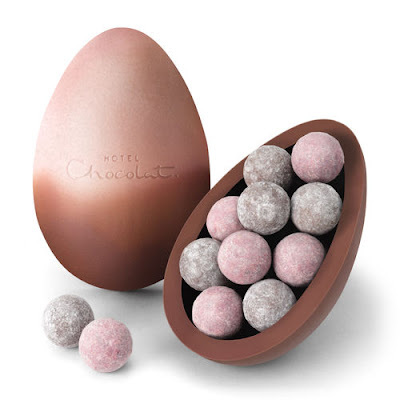 Inside the egg, wrapped in soft tissue you find a generous selection of Mercier Champagne truffles. 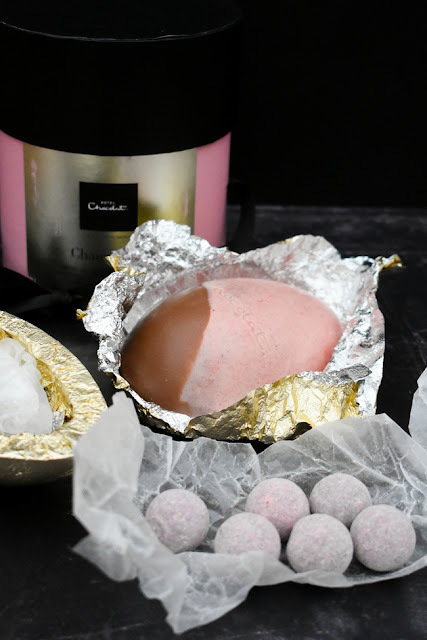 A mixture of champagne truffles and pink champagne truffles. The egg itself is super thick and the strawberry flavoured chocolate is divine. I have to admit I love Hotel Chocolat fruit flavoured chocolate. They do it so well. Sharing this egg? Forget it! 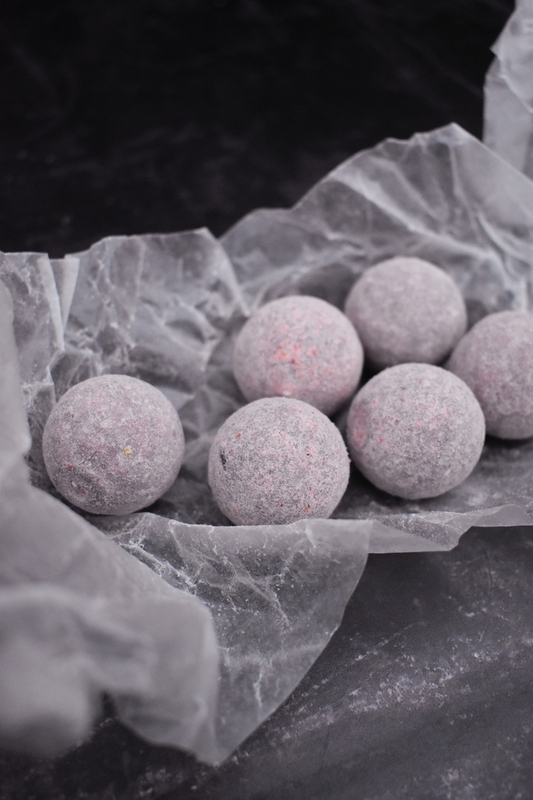 The champagne truffles are creamy and luxurious and they pack a hit of champagne. You can tell by the flavour they use real champagne. In fact they use Mercier Champagne and all of their ingredients are natural. It's a strong flavour but utterly delicious. WOW! The egg and truffles are suitable for vegetarians. 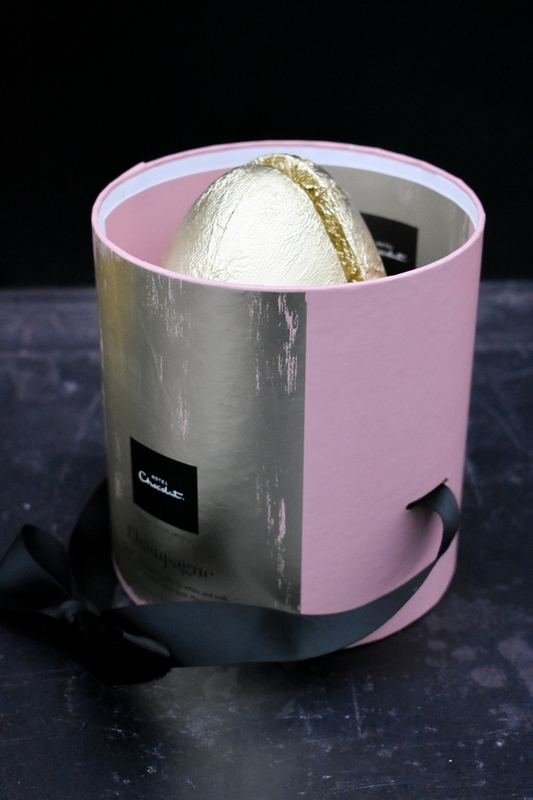 So would you like to win this luxury Easter egg from Hotel Chocolat worth £27? Leave a comment telling me your plans for Easter weekend. Look out for extra entries. This giveaway is open to readers who live in the UK and are over 18 years old. This giveaway closes on Monday 26 March 2018. Disclosure: I am running this giveaway in partnership with Hotel Chocolat. They sent me an egg to review and will send one to the winner. I was not required to write a positive review and any opinions expressed are my own. I'll be spending it with family in the USA. Can't wait! Leave me a comment telling me Your plans for the Easter weekend. Unfortunately im working for Easter weekend but I will make up for it the next week as I'm off on my holidays! I plane to eat my body weight I chocolate.......isn't that what everyone's doing? My sister will be visiting to help me recuperate following an op the week before - hope she brings me a chocolate egg! I am hoping that the weather will be kind enough for my family and I to take a trip to our nearest beach (an hours drive away). An Easter egg hunt in the garden with my niece and nephew! Great fun! I’ve got the whole family coming for Easter and will be doing a massive dinner! A nice quiet day with the family. Relaxing, eating chocolate and maybe doing a bit of reading about the origins of Easter. Weather and luck permitting, I will be flying my kite along the West Sands in St Andrews then tucking into my Hotel Chocolat Easter Egg. I don't know for certain just yet, but I will likely be working. No rest for the wicked! I will be looking after my poor, sick Husband & making sure he is happy & looking forward to getting better. May need to help him eat his Easter Eggs! Spending time with family and having a big roast dinner. That egg looks lovely. I will be working. I haven't had an Easter off for years. I will be organising an Easter Egg hunt for the Homeless Children I work with and sharing lots of chocolate with them. I'm hoping to have a quiet weekend at home although I'm sure it won't be as peaceful as I'd like. Meeting up with friends and eating chocolate. The real action-packed week coming up is the week of my birthday shortly afterwards. I have no plans at the moment. This would be a great prize for our annual egg hunt! We are spending a few days in Torquay, can't wait! No particular plans - although my husband and I will be exchanging eggs, as always. My mother in law makes a lovely roast dinner on easter so while she’s cooking I’m going to hide lots of tiny chocolate eggs around the house as a surprise egg hunt for her - adults can enjoy these things too! Would be great to win this egg to hide for an extra treat! Weather permitting, I'll be out in the garden, loads to do! My Easter plans include going to my parents, having a slap up roast followed by Easter Egg s'mores round the fire pit then we watch a terrible, easter themed horror film with cocktails. Same every year. Very excited that an old friend is coming to visit me in the country. We will no doubt just eat, drink and gossip like there's no tomorrow! I will be going out for a bike ride with the family, that is if the weather brightens up as its far too windy for the little ones at the moment. I plan to visit my daughter and husband in their new house. Happy Days ! We are going to Oxford for a few days. I'm hoping to be helping my partner take his children on holiday for the first time! Excited! My son lives 200 miles away and is coming home for the Easter weekend so we plan a meal out, a visit to an Escape Room and a day with various relations playing box games. We haven't got any real plans, just a nice family weekend. Family Meal & lots of chocolate! We're actually flying to Portugal for our holiday! We are just planning on a nice relaxing weekend at home. We hate holiday weekend travelling. staying in bed as long as I can! I have an easter egg hunt followed by a sunday lunch with family followed by movie night with easter eggs as treats. I have to admit I dont actually have any plans for the easter weekend. With the British weather being a tad unpredictable of late Ive decided to not plan anything until the day. Eating plenty of chocolate and spending time with the family. This Easter we are taking a trip to London as my husband works there during the week and he wants to show our daughter around. I think she'll love Buckingham Palace. I'm cooking a roast dinner for my parents as their kitchen is being ripper out ready for a new one that weekend! The mother in law is coming to stay so we will take her to Holywell on the Monday but I am sneaking out with friends to watch a band on Saturday night! Our Easter weekend will be quiet and delayed until the following week when we'll be celebrating 3 birthdays as well. This means loads of lovely food, loads of having fun and hopefully some mild weather to enjoy a day out. An Easter egg hunt, seeing family. I'll be seeing both sides of the family and hopefully be doing an easter egg hunt with my niece. Staying home and eating chocolate! We're in Brighton to see our son and of course a football match! I'll be working for most of it, but will enjoy a meal with my family. DIY at home for us! We have lots of odd bits & bobs to get done & have been putting them off! So it makes sense having 4 days off to get them done! We're sneaking away for a week. No-one knows yet! Will do an egg hunt with the kids too and a lovely family dinner. Working except for Easter Sunday when we shall do an Egg hunt for the children, then a nice family lunch, afterwards film for the children whilst us grown up's have an extra glass of vino, then for me an early night ready for work on Monday. During Easter I'm going to eat delicious sea food in Xabia, Spain, since I have some family living there. Life is good. I would just like to spend some time with my family! am working sadly but will be coming home to a nice Easter dinner! We'll be spending it at my mum and dad's house. Going to visit my mum and dad. I work for a charity and will be working all weekend. We'll spend the weekend at home with the family. I'll cook a special meal as usual on Easter Sunday. Taking my daughter to visit my parents and she is super excited as she misses her grandparents so much! Its my sons birthday so we are having a party with a giant easter egg hunt! Just a lovely family meal on Easter Sunday and taking the opportunity to relax! Laying an Easter Egg Hunt for nieces, and nephews, family roast with Prosecco followed by Golden Galaxy Cheesecake! Easter Egg hunt with family! We are going to take the kids camping. We will be at my parent's 65th wedding anniversary dinner on Sunday 1st April! I'm working night duty all Easter weekend, I'm hoping my husband rustles up a yummy Easter lunch. Hoping for good weather to be able to walk off the chocolate. I shall be having a boring Easter this year as we are both working! A family get together which is always fun. Hope the weather is good. I don't have any yet. Its my birthday on easter weekend so we are off out for a meal on the saturday and then a nice lamb dinner on the sunday followed by an easter egg hunt. Spend time with family and loved ones. We usually visit Mum on Sunday's, so plan to visit her on Easter Sunday. Church has a lovely Easter Sunday Event which we plan to attend. Easter is such a lovely time of year :- New life, chirping birds, brighter warmer weather, beautiful plants trees, etc. Hopefully we'll be having a family Sunday lunch. Gardening, IF the weather is good enough. Sadly ill be working all weekend!